This French duo certainly has done THEIR homework. This is the debut album of that world-famous house music guru duo, Daft Punk! Before they brought joy to millions with their 2001 hit "One More Time", they were not really into the neodisco scene. In fact, they brought some very rough tracks to the scene. It is very apparent that they meant business when they released "Homework" in 1997, which sent not ripples but huge waves through the music scene! The album starts off with a very basic fade-in styled intro in Daftendirekt. Here, we start off with the filtering-in of a deep voice repeating "Da funk back to the punk, c'mon." Nothing in this track is particularly ear-catching by itself, but when you meld all the simplistic elements together -- bass, beats, and pseudo-melody -- you get a track that you just can't pull away from! However, this nice intro is followed up by a rather superfluous additional introduction in WDPK 83.7 FM, which borrows a sample from one of their earlier tracks, "Musique" (which surprisingly did not make it on this album), and simply has another dark, deep voice tell us that we are listening to the "sound of tomorrow" and the "music of today", Daft Punk's Homework. OK, I think we knew that. I also didn't know that my FM dial went to the radio frequency of 83.7 -- you learn new stuff every day. Next, we hear the happy clubbers frolicking outside, followed by the party-pooping sirens and the screams of frightened folks who were once ready to dance the night away as they are told to "stop the music and go home." We enter Revolution 909 (which, in fact, really is not a revolutionary track in any perceivable way), a song that delivers a grand focus on a solid beat and a glowing synth. "Revolution 909" has been one of Daft Punk's singles from the album, and its video features the revolution of -- get this -- a tomato, from the orchard to the supermarket to a homemade tomato sauce (which ends up on a guy's shirt). Ah, the circle of life. The tomato in question is pictured to the right, by the way. Then of course, we arrive at one of the staples of Daft Punk's early career, Da Funk. Who could forget the music video for this, containing a man with a dog's head not getting much regard from the nightcrawlers of the big city? Poor Canine Man! Anyway, this is classic Daft Punk with its rough beats and acidic overtones that eventually build up into an amazing acid powerhouse that shows the true genius of Thomas Bangalter and Guy-Manuel de Homem-Christo! I'm wondering how I could ever NOT love this track. Phoenix rises up after the fun that was "Da Funk"; unfortunately, this one takes well over a minute to get started, and when it does, it delivers a sort of ersatz old-school-sounding synth that won't really blow you away. The bass that comes in around the 2:23 mark is quaint though. This is followed by Fresh, which starts off with a very ambient ocean tide introduction, followed by a fake electric guitar that leads us into the main area of the track, which is basically the repetitive filtered vocal sample which cannot be discerned. Not exactly "fresh", but still it gets the job done (if the job is to be an average song). One of Daft Punk's old trademark tunes is indeed the seventh track, Around the World. Boasted in full force by the unforgettable music video featuring the dancing skeletons, mummies, spacemen, and synchronized swimmers, this is perhaps one of the reasons why Daft Punk is so famous worldwide. The song (in its 7-minute entirety here) combines a squeaky clean poppy sound with a wicked bassline and a simplisic 4/4 beat into a very soft-spoken but addictive house phenomenon! Let's not forget the vocoded "Around the world, around the WORLD..." phrase that repeats many times but never seems to get old. When people hear this track in the clubs (or, God forbid, at high school dances...), they can't help but want to get funky! Admittedly, perhaps "Around The World" is a bit overrated (or at least overplayed), but it's still one of Daft Punk's more solid offerings on this album. And now for the official 'love it or hate it' track on the album -- yes, it's Rollin' and Scratchin', the track where you can't just 'like' it -- you either adore it or despise it; there's no in-between here! This track (which takes quite some time to reach its climax) was one of Daft Punk's first, and thankfully it made it onto this album is its original form. The reason why many people are so turned off to this track lies in its use of a rather abrasive squealing effect, which is used as much as possible here. The squeal can be tough on innocent ears, and therefore caution should be taken! My personal favourite part of this track happens closer to the end, when the hard squealing sound slowly winds down...then quickly returns in an even more powerful and high-pitched state! Sweet! I am one of the lovers of "Rollin' & Scratchin'", but it's ultimately up to you to test your own tolerance. The next track, Teachers, is one that most people probably pass over a lot. It's pretty much a high-pitched voice and a low-pitched voice in sync, giving their shout-outs to famous DJs or dance projects for a few minutes over a wussy clap beat. It is succeeded by High Fidelity, a track that will make you think your CD player is skipping. In my humble opinion, I feel that this track defines the sound of French House, with its smooth placement of jazz background instruments, vocal clips, and its generous use of filters without overdosing. Granted, it's not the most exciting track (read: repetitive) but it's still a potential dancefloor filler. Rock n' Roll follows the same style as "Rollin' & Scratchin'," but not quite as amicably. There's not much of a build-up, just increased abrasiveness of a weird rolling synth-scratch. It's not particularly impressive; there's not even a bassline! Plus, they REALLY could've shortened this to three minutes. It's followed up by Oh Yeah, which is another throwaway track that, aside from some glitchy tech sounds and girls saying "Oh Yeah," it's a dull track. Thank goodness it's short. Daft Punk redeems itself after a pair of lackluster tracks with Burnin'. Although the track itself isn't REALLY burnin', at least there are sirens in the background at times. An enticing laser synth densely rolls over a funky blend of swift bass and hi-hats. If this track is good for anything, it's chairdancing (that is, dancing in one's chair, as I often do). Indo Silver Club is actually another of my personal favourites from this album. Sporting twiddling piano notes and one of the bounciest bass synths I've heard yet, and it is the clever combination of the two in a very basic manner that makes this house track so delightful. 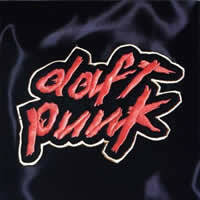 It is followed closely by Alive, an evolution of Daft Punk's very first track ever, entitled "The New Wave". "Alive" is trapped within a darker style of house that offers a very full set of driving percussion. It's a nice track, but it's not varied at all, and is far from stellar or crowd-jaw-dropping. The album ends with a yawn though, with Funk Ad, a less-than-a-minute-long outro that feels like they just decided to play a Daft Punk track backwards and cut it off before the one minute mark. They could've gone out with a more illustrious bang, but you get what you get. This album took everything that was known about house music, stuffed it in a Ziploc bag, and shook it up like Shake 'n Bake. This is a revolutionary album that all house lovers should soak up like musical gravy, as it set the bar a lot higher for future acts to follow and is a milestone in house music history. It's not perfect, though, but it works.